Constable's work transformed the genre of landscape painting and shaped the enduring popular image of the English countryside. 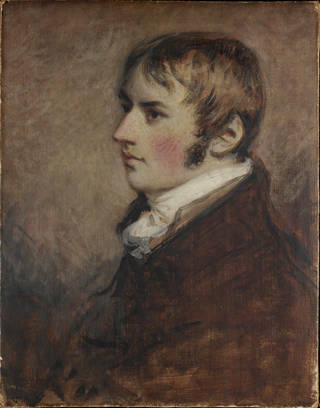 Born at East Bergholt in Suffolk, John Constable (1776 – 1837) was the fourth child of Golding and Ann Constable. In 1792 he began work in the flourishing family business, trading and transporting corn and coal on and around the River Stour. He first took up painting and drawing as a gentlemanly pursuit under the guidance of a local amateur artist, John Dunthorne. A turning point for Constable came in 1795 when he met the amateur artist and collector Sir George Beaumont and was exposed to Beaumont's collection of major paintings by the Old Masters. A grounding in art history and theory came from his contemporary John Cranch, who supplied him a list of 'Painter's Reading', while his friend John Thomas 'Antiquity' Smith lent him drawings and prints. Constable entered the Royal Academy Schools in London in 1799 to embark on a career as a painter. Like most professional artists of his time, Constable needed a base in London to negotiate with prospective buyers. In 1816 he married Maria Bicknell and set up home in Bloomsbury the following year. But living in central London didn't suit him and eventually the family settled in Hampstead, (then outside the city), where they lived permanently from 1827 onwards. Constable's biographer, C.R. 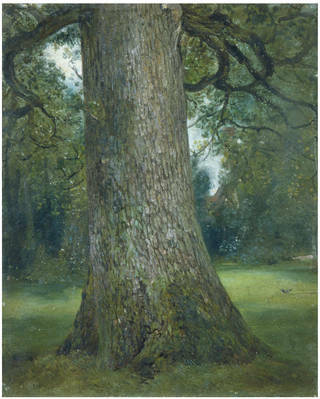 Leslie, wrote that the life work of Constable was "a history of his affections". Constable himself wrote that painting "is with me but another word for feeling". He undoubtedly had a nostalgic attachment to the countryside of his boyhood – the Suffolk villages of East Bergholt, Dedham, Stratford St Mary and Langham – and perhaps especially the views of the River Stour. He also frequently painted Hampstead and Salisbury – where his closest friend John Fisher, nephew of the Bishop of Salisbury, lived. I shall shortly return to Bergholt where I shall make some laborious studies from nature… there is little or nothing in the exhibition worth looking up to – there is room enough for a natural painture. Constable made his 'laborious studies' during sketching tours of the Lake District and elsewhere. He attempted to approach nature with a fresh eye and an open mind, proclaiming his love of, "willows, old rotten banks, slimy posts, & brickwork". However, translating what he described as "a close and continual observance of nature" into a finished composition was an ongoing challenge. Many of Constable's exhibition paintings were the result of a complex process of development, sometimes spanning a number of years. They were composed from a wide range of oil sketches, graphite drawings, watercolour studies and earlier paintings. Faced with the financial pressures of a growing family, the commercial success of his paintings became increasingly important. For Constable's six large scenes of the River Stour, including The Hay Wain (1821) and The Leaping Horse (1825), he adopted the painstaking process of making full-size preparatory oil sketches. 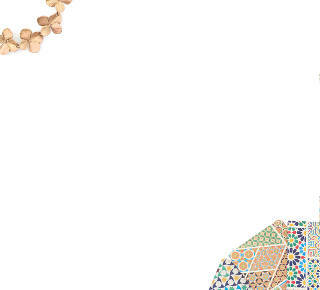 They helped him to coordinate motifs and balance colour, light and shade, solving compositional problems while retaining the freshness of his smaller drawings and oil sketches. These six-foot canvases were some of Constable's greatest successes when exhibited at the Royal Academy between 1819 and 1825. Constable continued his studies of nature despite changing family circumstances (his wife Maria began to suffer from tuberculosis). In the early 1820s, while in Hampstead, he embarked on a series depicting clouds and atmospheric effects, writing to his friend John Fisher, "That landscape painter who does not make his skies a very material part of his composition – neglects to avail himself of one of his greatest aids". His wife's poor health meant that Constable took lodgings for his family in Brighton from 1824 until 1828, the year of Maria's death. 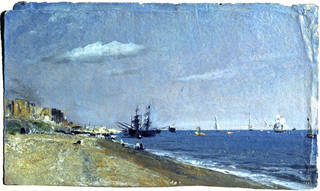 Drawings and oil sketches from this period record the artist's fascination with his surroundings during his extended visits to Brighton. We recently discovered that the reverse of Brighton Beach With Colliers (1824), is annotated with notes about the scene describing, "cliffs & light off a dark grey sky effect – background – very white and golden light". Dr John Fisher invited Constable to stay in the Bishop's Palace in Salisbury in 1811 (he would later commission Salisbury Cathedral from the Bishop's Grounds from the artist). 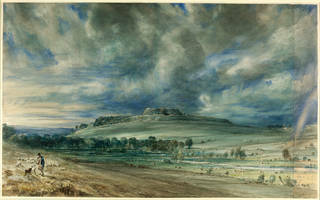 After 1829, when Constable abandoned oils for outdoor sketching, two of his most powerful watercolours – Old Sarum (1834) and Stonehenge (1835) – depict places he had visited while staying with his friend. To the Romantics, the rainbow seemed the ultimate image of everything in life that was beautiful but transitory, visible but intangible. 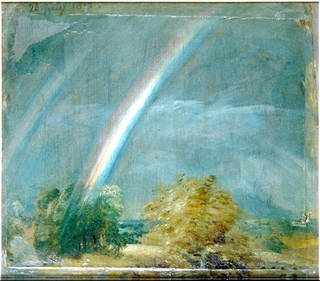 Constable himself wrote, "Nature in all the varied aspects of her beauty exhibits no feature more lovely nor any that awakens a more soothing reflection than the rainbow". 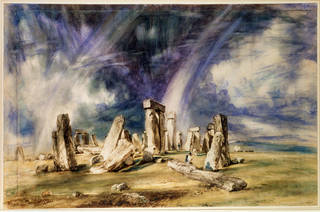 He repeats the motif with a double rainbow in his later watercolour, Stonehenge (1835). Constable was inspired by the landscape of his native countryside rather than the mountainous scenery favoured by the Romantics. However his subject matter was sometimes more directly Romantic, depicting ruined or wild landscapes. His 1834 representation of Salisbury's ancient settlement, Old Sarum, has been described as, 'one of the most powerful statements of Romanticism to have been produced in England'. 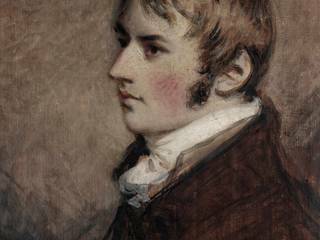 Constable's decision not to follow prevailing artistic norms meant that he had little success for many years and was not elected a full Royal Academician until 1829, at the late age of 52 (Turner, his great rival, was elected at 26). 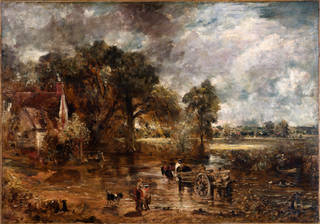 However, by combining the compositional ideas of the old masters of classical landscape with a naturalistic vision that was entirely his own, Constable would ultimately transform the genre of landscape painting – in the process shaping the enduring popular image of the English countryside. The first director of the V&A, Sir Henry Cole, recorded in his diary on 31 July 1856 that the collector John Sheepshanks had offered his paintings collection to the nation. 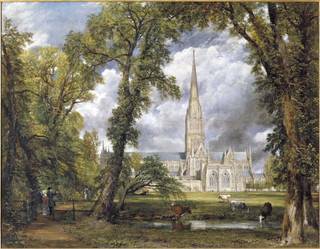 Sheepshanks' collection included around 233 paintings, almost all by modern British artists, with six by Constable, most notably Salisbury Cathedral from the Bishop's Ground (1823). But the Museum's most important Constable acquisitions came from the artist's last surviving child, his daughter Isabel, who had inherited and cherished the main part of the family collection. She wrote that she would present to the Museum, "some Landscape Sketches by J. Constable R.A.… they can be put in a box quite ready for removal". There were, in fact, no less than 297 drawings and watercolours, 92 oil sketches, three easel paintings and three sketchbooks.